Imagine this: Your 19-year-old daughter is away at college, driving the car you bought her a few years ago. The car is titled in your name. She causes a five-car pileup. She is OK, and no one else is seriously injured. However, three separate lawsuits are filed against you as the car owner. As if this wasn’t enough, another person, who simply witnessed the accident, files a lawsuit against you for negligent infliction of emotional distress, seeking damages of $150,000. This scenario may sound far-fetched, but it’s not. A friend of mine is going through it right now. For most people, a car accident — caused by you, your child or your spouse — is probably your No. 1 source of potential liability. But you can take several easy and inexpensive steps to mitigate the risks that come with driving or having others drive cars titled in your name. This is the easiest thing you can do to protect your assets, and it applies almost across the board. The only exception is in the case of minor children because you remain liable for your child’s actions until he or she becomes an adult. But the day your child turns 18, you should sell or gift the car to him or her, whatever it takes to get the car titled in the child’s name only. This also applies to spouses. If your spouse is driving a car titled in your name and he or she causes an accident, a plaintiff could come after your assets, your spouse’s assets and any jointly held assets. If, on the other hand, your spouse causes an accident while driving a car that is titled in his or her name, a plaintiff can come after only individually owned assets. If you have good umbrella coverage (see below) and have your assets titled properly (see below) you will likely not be hurt financially. Procedures to transfer title on a car vary, so check with your state’s Department of Motor Vehicles for information on how to do so. An umbrella liability insurance policy provides you with personal liability protection above what your automobile and homeowners policies cover. A serious car accident can lead to millions of dollars in damages. If your auto insurance policy covers you for $500,000, and you are found liable for $1 million in damages, then a $1 million umbrella policy would step in and pay the extra $500,000. If you are found liable for even more, your policy would cover the amount in excess of the $500,000 your auto policy pays, up to the limit of the umbrella coverage. If you have teenage children driving cars titled in your name, the bigger your “umbrella,” the better. I know the day I turned 16, my father, who is also a financial planner and the principal of our advisory firm, increased his umbrella liability coverage to $5 million. 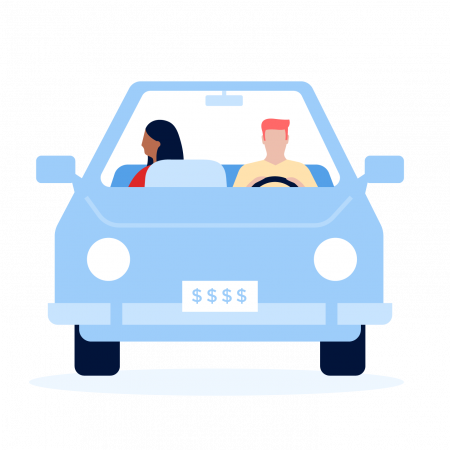 You can purchase such a policy from your auto insurer (or another insurer), and coverage shouldn’t cost you more than around $300 per year per $1 million in coverage. About half of the states in the U.S. offer married couples a form of joint ownership called “tenants by the entirety.” If you live in a state that allows such ownership, you might want to take advantage of it. This type of joint ownership provides very strong asset protection. If you own something with your spouse as tenants by the entirety, you both own 100% of the asset. This means that if you cause an accident while driving a car appropriately titled in your name, a plaintiff cannot come after funds in an account you own with your spouse as tenants by the entirety because your spouse also owns 100% of the funds in that account. Simply go to your bank and brokerage company and ask them to title your accounts this way. But the laws on asset titling vary greatly, so check the rules where you live by searching online for your state’s statutes. In some states, for instance, tenants by the entirety applies only to real estate, and in other states there may be other types of joint ownership available to you instead. However, be aware that other forms of joint ownership do not give you nearly as much protection as tenants by the entirety, so if you live in a state without this type of ownership, your best bet is to have a large umbrella policy to protect your assets. We can be careful drivers and teach our children to do the same, but we can’t completely eliminate the risk of accidents. No matter how prepared you are, a car accident can change your life in just a few seconds. And even if you are properly insured, it’s not always enough to cover the damages you or your family could be found liable for. Be proactive in strategically protecting your assets, just in case. Rachel Podnos, J.D., CFP, is a fee-only financial planner with Wealth Care LLC.